7 Climbing log entries Found. A beautiful (weather and scenery-wise) but horrible (snow conditions-wise) traverse along Rocky Peak Ridge, and a kick-off to a prep for a 2015 version of the Great Range Traverse. Plenty of dry, open ground down low at the New Russia end, all the way up to and over Blueberry Cobbles. A few patches of soft snow on north-facing slopes, but nothing significant until the top of Bald. Beautiful clear skies and calm conditions. As usual, the walk over the Cobbles was most pleasant. After Bald, every spot in the trees had significant snowpack. Furthermore, the snowpack was mushy and very soft. Putting on snowshoes did not stop post-holing, but it did make passage at least possible. We left our snowshoes on for the period dry open spots, since it would have been too troublesome to take them off and put them back on repeatedly. The climb up to the east end of Rocky's ridgeline was very tiring with the snow conditions, and we took a long break at the first of the good lookouts near the top. Following Rocky's ridgeline was a bit better, with frequent dry bedrock sections and a relatively flat grade. And, of course, good views west to Rocky's and Giant's summits. Deep soft, yucky snow returned around the Lake Mary Louise area, briefly abated along the open meadows, then returned just before Rocky's summit. We were glad to see others on the summit of Rocky, as this likely meant some extra traffic to beat down the trail beyond. This proved to be the case, and the postholing ceased to be a problem after Rocky Peak. Our slow pace from the bad snow conditions meant it was after 5pm by the time we reached Giant's summit. We split up to improve the logistics of the car shuttling, with three of us arriving more than thirty minutes before the rest. We were therefore able to retrieve the far vehicle before the remainder of our group arrived at the trailhead. Eleven long and tiring hours - but good training for a re-do of the Great Range Traverse hike! Jenn and I joing Pu and his hiking group for another west-to-east go at the best-in-class Rocky Peak Ridge traverse. 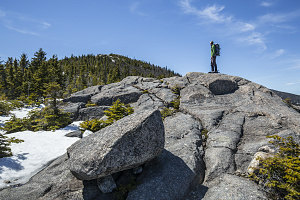 There were nine of us in total, and we had a beautiful moderately-paced hike up the Giant Ridge trail to Giant's summit, then the long but rewarding ridge hike from there to Rocky Peak and down the ridge beyond. The conditions were absolutely perfect, with warm temps, no clouds, no wind, low humidity, no bugs, and almost completely dry trail conditions. One really couldn't ask for any better. Please refer to the link below for the full trip report with lots of pictures (including a section focusing on views of the trail itself). Today we joined Pu and his hiking group for a glorious Rocky Peak traverse hike, this time from west-to-east (a first for me). Weather was awesome, if a bit hazy. We made excellent time going up the super-scenic ridge trail, with a few of us peeling off to check out the Giant's Nubble on the way up. Met Bill and Judy on the way up, at almost exact same spot we first met 3 years ago. Bill was finishing his 46th on Rocky today, and I was honored to be there to share in his moment. Congrats! Beautiful hike, as usual, along Rocky Ridge. Unfortunately not much color yet, even though we were at the end of September. Must come here again at full color sometime! All went well as we slowly and scenically descended east to Lake Mary Louise, Bald Peak, and finally down into the forests before arriving at the New Russia trailhead nine hours after we started. Excellent hike! We wanted to take advantage of a nice and clear winter weekend day that had presented itself to us after so many weeks of very wet and soggy conditions. I'd always wanted to do the Rocky Peak Traverse in winter, and I wanted to do it when it was nice and clear. So, this seemed the perfect day, albeit a little bit on the cold side: the forecast for the day was in the -25C range without wind chill! The hike went well, and the weather was cold but very beautiful. No one had been on the route since the last snowfall, although below 3000 feet there was so little snow (less than 6 inches) that we barebooted it. Bald Peak was a perfect spot to have lunch, although by then it was already 1pm. By the time we got to the main ridge of Rocky Peak, it became apparent that we were making less progress than we thought. It was getting colder and the prospect of doing a significant and challenging portion of the hike in the dark was a daunting thought! After Rocky Peak, the last steep ascent up Giant I found very tiring. We spent about 30 seconds in pitch black on the very windy summit of Giant (nice views of twinkling lights in the valleys, though). The way down from Giant had been steep and very treacherous and icy in spots; I was very cautious about my ankle, not wanting to aggravate the sprain that was healing nicely; The muscles in Caroline's back were bothering her, making it difficult to move in certain ways. Pu's and Caroline's headlmaps both had failures and were not working. So, it took us a long time to get from the summit to the end of our route. We arrived at Markus' car not long before 9pm. I was feeling particularly tired. I don't think I ate quite enough on this trip. Anyhow.... we were all back safe and sound. An interesting and challenging adventure, that's for sure! My second visit to Rocky Ridge Peak, and who knows how many for Ewart. This was a test hike for Angelina, who was interested in ramping up her hiking skills to see if she could possibly be ready for an extended hiking trip this summer. It was a beautiful day and the trail, as before, was wonderful (see my description of my first hike of this ridge). Angelina found things a bit tiring but soldiered on, especially enjoying the many blueberries on blueberry cobble (where else?). The nice sunny day started to give way to increasing clouds, but visibility was still good. Soon we were atop Bald Peak; definitely cloudy now, and a bit cooler and windier. Slowly we toiled our way up the steep ascent past Bald peak and up onto Rocky Peak proper. It started to drizzle and rain on and off. We stopped for lunch just beyond the lake during a short shower. Fortunately, the weather cleared up a little after that and we were treated to a slightly windy but relatively dry hike from that point up to the summit, where it was quite windy. Someone had stuck an small American flag in the summit cairn and it was fluttering fiercely in the wind. Angelina didn't look too pleased about the col between Rocky Ridge and Giant that had to be negotiated, but seemed resigned to it at this point. Eventually we made it to the trail junction near the summit of Giant, and managed to convince Angelina to take a few extra unnecessary steps so that she could summit her second 46er peak!. I took my obligatory Dare Cinnamon Danish summit shot (tough to do because the wind kept blowing the box down before I could take a picture), and then we started our descent, being careful of slippery rocks. 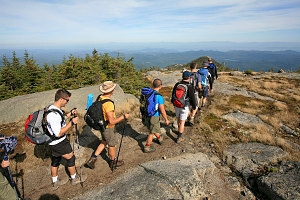 We chose the Giant's washbowl route, which is a nicer hike with lots more lookouts than the Roaring Brook route. Angelina's boots were killing her feet on the descent, which seemed a bit extra strange until she revealed that they were actually 1 and 1/2 sizes too small! no wonder! I did some rejigging of the laces to temporarily reduce the problem and we slowly made our way down. Giant's washbowl had lots of annoying insects, but was otherwise very scenic. Soon we could hear the cars rushing by on Route 73 and before long we were done. Angelina had done pretty well, I think. Good Job! 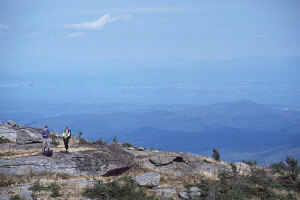 Image Gallery: July 2003 Rocky Peak hike. 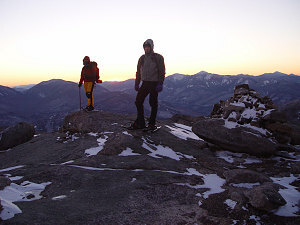 My friend Ewart had always told me that the traverse over Rocky Peak was one of the best outings in the Adirondacks. This route is usually done as a point-to-point, starting at a trailhead on route 9N or at the Giant Mountain trailhead on Route 73. There is a lot of elevation gain and loss on this hike, including many ups and downs over subsidiary bumps and peaks along the ridge. Myself, Lorraine, and Peter decided to do this one fine fall day. We started at the route 9N trailhead. 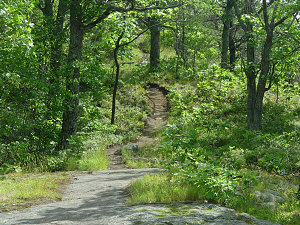 As a pleasant start, a nice uphill trail climbs through unusually open woods (at least by Adirondack standards). 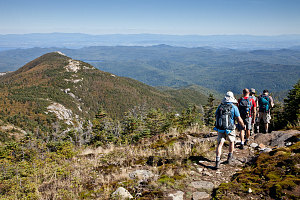 Not only that, the trail is not 'bouldery' like many other Adirondack trails. Not long after that and a brief steep section the first of the open cobbles is reached (blueberry cobble, I think). There are very neat sections of nice trail winding over the tops of these cobbles with many little lookouts. The vegetation is somehow different on this trail (compared to most of the Adirondacks), seeming less coniferous and more open. After these pleasant cobbles, a steep down-and-up col marks the start of the next major part of the climb up to bald peak. A few scrambly bits and lots of good lookouts, culminating with an excellent summit at bald peak with lots of open rock. From here you can see views of most of the ridge you must follow, and it can look a bit daunting from here, because you can see a lot of the up and down that you have yet to do. Lorraine was still breaking in some new boots and was suffering from a few blisters, and so we stopped and fixed her feet up. The trail then follows the ridge westward, often in the open, sometimes near short cliffs, past some very large glacial erratics. Good views of fall foliage down below. Next comes the part that I liked the least, which was first a descent of a few hundred feet, then a long relatively boring ascent up to the main Rocky Peak Ridge section. Once past that, things got better again, with some good bits of a ridge that had lookouts, and then a very neat little lake tucked up on the ridge, called Lake Mary Louise. Once around that we emerged out into the very nice partially open meadows of the summit area of Rocky Peak. There were nice long sections of open hiking, and relatively easy grades. Soon the open summit of Rocky Peak is reached, at which point I took some closeup shots of Lorraine's boots at the summit marker. From here you get an excellent look at the back of Giant mountain, with some large slides visible, and also of the deep col between yourself and Giant. After having hiked up and down all of that elevation so far, this looks pretty tiring, since the trail goes all the way down to the bottom of the col and then practically all the way up to Giant's summit before starting its descent down into Keene Valley and the ending trailhead. Anyway, there was nothing to be done but to do it, so down and up we went, huffing and puffing but knowing that this was our last big ascent and after this it was all downhill. Near the summit of Giant we took the short couple-of-minutes detour to visit Giant's summit, and then it was down via the Roaring Brook trail. Dusk fell as we descended and we finished that last kilometre or two with headlamps. Not a long hike distance-wise, but still fairly difficult because all of the elevation gain and loss. An excellent hike, though - lots of variety, lots of scenery. Image Gallery: Oct 1999 Rocky Peak and Giant hike.